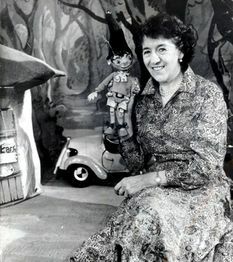 The Adventures of Noddy was the first TV series to feature Enid Blyton's famous character Noddy. 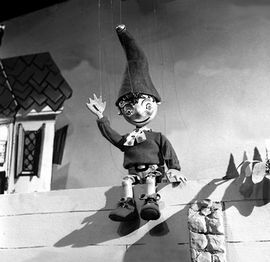 It was a string-puppet show that ran on ITV from 1955-1956 and BBC from 1955 to 1963. 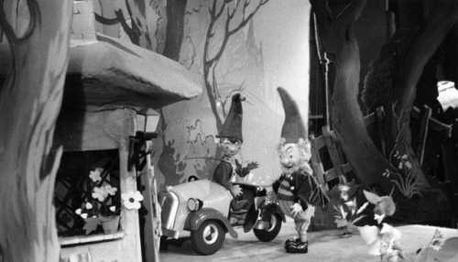 Although episodes of other Noddy shows have been found, very little footage of the 1955 series resurfaced. 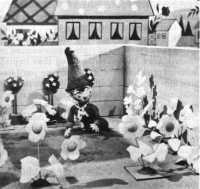 Part of an episode was shown in a VHS documentary special hosted by Phillip Schofield: Best Children's TV Of The Decade: '60s and '70s. 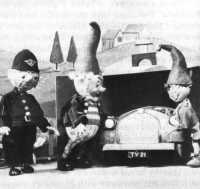 In addition, footage was also shown in a 1957 TV advert for "Kellogg's Sugar Ricicles". Footage of an episode in a documentary, at 22:05. 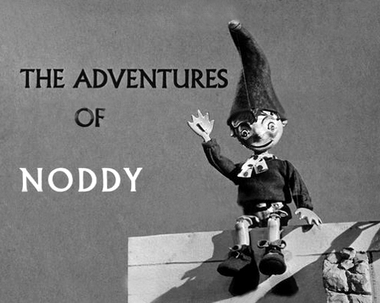 Episode is very probably Noddy's Camera. Commercial for Kellogg's Sugar Ricicles. ↑ 1950s Childhood: From Tin Baths to Bread and Dripping. Retrieved 03 Dec '17. ↑ TV Toys. Retrieved 03 Dec '17.